Welcome to the JCPenney Dynamo Newsletters collection. 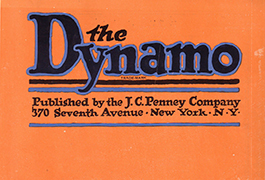 The Dynamo, a monthly company magazine first published in April 1917, was designed to educate and motivate JCPenney associates. 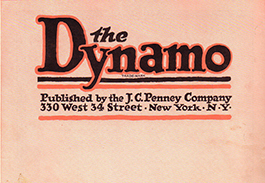 Each monthly issue of The Dynamo contained company news, inspirational messages, and training to help associates increase sales. 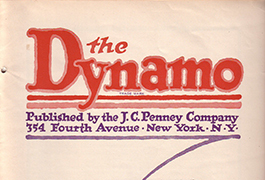 JCPenney started its first company-wide newspaper, The Dynamo, in April 1917, 15 years after the company went into business. At this time, JCPenney was entering a period of tremendous growth with 177 stores and sales of $14 million. Mr. Penney’s main goal for The Dynamo was as a motivational and educational tool for JCPenney associates (employees). His secondary objective for the newspaper was to disseminate company news. 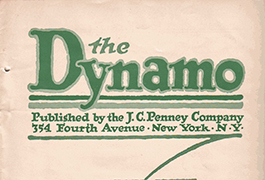 In the first issue of The Dynamo, the editors said, "Let us, through the pages of this magazine, work together to make the J.C. Penney Company, not only the greatest concern of its kind in the United States, but the most unique in the world." 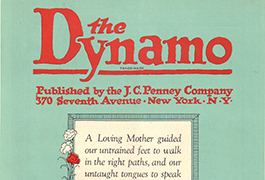 Each monthly issue of The Dynamo contained company news, inspirational messages, and training to help associates increase sales. Photographs of store windows (an important part of local advertising) were featured, and the back page often included a map of the United States with the number of stores and locations noted. Writers included Mr. Penney, other company executives, store managers and their wives, as well as regular associates. 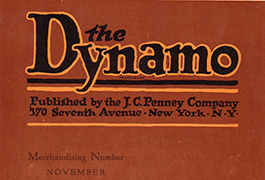 During the first decade of The Dynamo’s publication, JCPenney continued to grow at an incredible rate. At the company’s silver anniversary in 1927 there were 892 stores and sales of $151 million. plummeted. JCPenney was forced to scale back its training opportunities and to cancel its company newspaper in March 1932. That year, there were 1,473 stores and sales of $155 million. 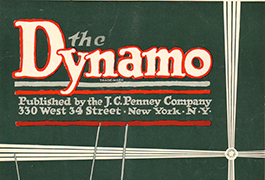 Thanks to a grant from the JCPenney Company Fund, Inc., a selection of 31 issues of The Dynamo has been digitized and is available for educational use. These magazines not only provide a unique glimpse into JCPenney’s corporate history. They provide a remarkable view of American consumer, financial, and social history. This collection is part of Southern Methodist University's DeGolyer Library, which houses the JCPenney Archives, as well as Mr. Penney’s personal papers. In 2004, JCPenney donated its corporate archives and the papers of James Cash Penney (1875-1971) to Southern Methodist University. Both of these collections are available for use at the DeGolyer Library. The Penney Archives includes over 20,000 photographs, 1,500 linear feet of correspondence, speeches, ledgers, catalogs, and company publications documenting more than 100 years of corporate history as well as advertisements from 1903 to the late 1990's. philanthropies. In addition, there are also manuscript collections of Caroline A. Penney, his third wife, and correspondence of one of his nephews. DeGolyer Library digital collections are part of SMU Libraries Digital Collections, which contain thousands of digitized photographs, manuscripts, imprints, and works of art held by SMU Libraries special collections. The JCPenney Dynamo Newsletters collection was made possible thanks to a grant from the JCPenney Company Fund, Inc. Each issue was scanned in 2005 by Lauren Ostergren, a Southern Methodist University STARs student. The digital collection was created by SMU Libraries' Norwick Center for Digital Solutions, DeGolyer Library, and Systems Office.